To the surprise of no one, Frankie Edgar was involved in yet another close decision. Once again, “The Answer” was not provided with the verdict he was expecting. 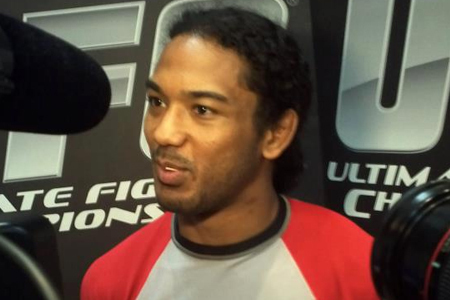 Benson Henderson (Pictured) posted a highly controversial split decision victory to retain his lightweight title in last night’s featured attraction. According to UFC president Dana White, 15,008 fans packed the arena, garnering a live gate of just $650,000. White reiterated there will be no trilogy between Henderson and Edgar. Nate Diaz gets next dibs. Cerrone wants Anthony Pettis next. White likes the idea. There was a fight in the hallway during the presser that White had to break up. Rumor is, it was between Edgar’s manager and Henderson’s manager (Malki Kawa). If Edgar drops to featherweight, White says he’d have to collect one 145-pound win before earning a title fight. Henderson and Edgar both believe they did enough to win. Edgar was gracious in defeat. Cerrone says he still owes Uncle Sam, so his bonus checks will go towards paying taxes.